Publisher: Simon & Schuster, Inc. The new Abby Abernathy is a good girl. She doesn’t drink or swear, and she has the appropriate percentage of cardigans in her wardrobe. Abby believes she has enough distance between her and the darkness of her past, but when she arrives at college with her best friend, her path to a new beginning is quickly challenged by Eastern University's Walking One-Night Stand. I was so excited to get my hands on an advanced reader of Beautiful Disaster, as I had heard so many different thoughts on the book. I wanted to read the book so that I could form my own opinion of the story. I have to say, this book is a roller-coaster ride, and will leave you with very mixed emotions. Abby Abernathy has a secret past, one that she has run a long way from. A new school with new friends, a new beginning is exactly what she needs. All is well, until she catches the attention of the school bad boy, Travis Maddox, who is completely blown away by her resistance to him. Never one to be rejected, Travis does whatever he can to get Abby into his life. But can Abby live with the dominating Travis in her life? Abby, the main character, was both headstrong and also extremely frustrating. I love that she stood up to Travis’s crazy ways, for the most part, especially when there were red flags going up all over the place. However, it was insanely frustrating that she used other guys just to hurt Travis. It really made me want to shake her and tell her to quit playing games. But other than that, I found her to be a likeable character. The secondary characters were interesting as well, with my favorites being Shepley, Travis’s cousin and America, who was Abby’s best friend. America was a really great friend to Abby. There was also Finch, who Abby and America met on their first day of school, who was a loner just like Abby. I love him! If you love a good love story, full of emotional angst and drama, this is definitely the book for you. I loved the storyline as well. That kept me hooked, and flying through the pages faster than I expected to. Overall, I really enjoyed this book, so much more than I expected to. This is a book that will stick with you long after you’ve read the last page. I can’t wait for my finished copy to arrive so that I can read it again! 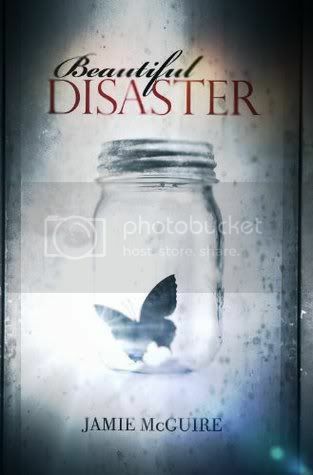 Also, we will also be getting a book in 2013 that is Beautiful Disaster from Travis’s perspective; Walking Disaster. I SO can’t wait to get my hands on it! I love Beautiful Disaster! I think it features a highly dysfunctional relationship which like you I understand but I completely agree about a younger crowd wanting to read it and it not being appropriate. It's definitely an adult book, but Travis is great (and not so great) and I loved following Jamie on FB as she was writing Walking Disaster. I'm just not sure about this one. I saw it on NetGalley but...I don't know. I have a hard time with damaged teen relationships, mostly because I picture teen girls reading the story and just not getting how toxic it really is. I truly think that this is not a book which aims at Teenage Girls. It's definitely not YA. An I am so happy you liked it... I LOVED this book so much, it was incredibly! A very deep relationship and I liked the intensity! My heart broke for Travis too - especially when Abby (again) left him *sniffles*! Ooh, this sounds so good! And it seems more new adult than YA to me, which I'm excited about. I have this from NetGalley and I can't wait to read it! I totally agree with you on this. I loved this book, but would definitely not let young teens read it. I absolutely ADORED this book and I'm so glad you loved it too!! I literally just finished reading it yesterday and I'm head over heels for it. I got it on Netgalley and I'm buying a physical copy ASASP!! I agree that older teens and adults should read it. Those who understand how harmful these types of relationships can be. I thought this novel was fast paced, and insanely readable, but the relationship soured me a little. I LOVED Finch and totally wish we had seen more of him! Your review points out all that I enjoyed about the book, and the the elements that left me conflicted too! Great review.